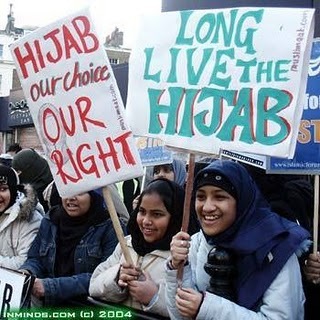 This entry was posted on Monday, April 15th, 2019 at 11:05 am	and tagged with first amendment, hijab laws, liberals vs. religious freedom, Quebec to ban "religious clothing", religious freedom, secular bigots, secular tyranny and posted in news. You can follow any responses to this entry through the RSS 2.0 feed. « No More Work? Now What’ll We Do? Another instance of “be careful what you wish or ask for, you just might get it. The biggest problem with the “religious clothing” ban is that things like the hijab, niqab, burka, etc. are not actually religious clothing in Islam. They are cultural, and were originally worn to protect from the elements in a desert climate. In the koran, the word hijab is only used a couple of times, and refers to a barrier. Not an article or clothing, but to something like a screen room divider (that women could peer through at the men on the other side, without being seen by the men). A woman is supposed to dress “modestly”, which means hiding the shape of the body and, by Islamic general acceptance, only the face and hands are exposed. How this is to be accomplished is not specified, probably since typical desert clothing already met the requirements. Which means that followers of Islam can get around the ban by accurately saying that specific items of clothing, such as the hijab, are not religious but cultural, and do not qualify for the ban. And of course, not all Muslims go in for hijabs and burqas, etc. This reminds me of Muslims in America taking offence at crosses, even covering up crosses in cemeteries. As a result, my wife and I have purchased a large cross to put on the side of our house facing the street – take that, Allah.